Most of us want to look as young as possible for as long as possible, so it’s no surprise that wrinkle creams are a multi-billion-dollar business. Every one of them claims to improve signs of aging in noticeable ways, but how many can back that up with results? We’ve been analyzing wrinkle cream ingredients and the research behind them for over 30 years, and here’s the truth: It’s not about the claims and prices, it’s all about what’s inside. Skin-replenishing ingredients. This group of ingredients includes ceramides, hyaluronic acid, and omega fatty acids. They benefit skin by delivering revitalizing hydration and keeping it there. The result is softer, smoother, plumper-looking skin. Skin-restoring ingredients, including retinol, niacinamide, and peptides. These ingredients help “talk” to skin in a manner that lets it restore itself the way it did when we were younger. Antioxidants. Antioxidants are truly workhorse ingredients, defending against environmental stressors such as pollution that can damage skin’s surface and make it weaker. Note that skin’s natural supply of replenishing, restoring, and antioxidant ingredients dwindle with age and accumulated sun damage, so giving these ingredients back in abundance is critical for younger-looking skin. If it’s labeled a day cream, SPF must be provided. Sun protection is the single most important thing you can do to keep skin looking younger. 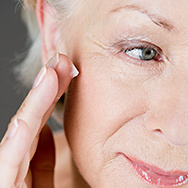 Sun damage is a major cause of most of the signs of aging, so avoiding it is vital! Stable packaging. Even if a wrinkle cream is chock-full of great ingredients, if it’s not packaged stably, those ingredients lose their effectiveness as soon as it’s opened, meaning it’s a waste of time and money. Instead of jars with twist-off lids or clear packaging that isn’t UV-coated, look for tubes, airless jars, pumps, sprays, or bottles that protect a formula’s best ingredients. Gentle formulas. Fragrance can make a wrinkle cream smell divine, and SD or denatured alcohol can make it feel lighter and absorb faster, but the irritation such ingredients cause can trigger processes in the body that are pro-aging. If your wrinkle cream checks off all these boxes, then you have one that’s truly great and will yield results you’ll be happy to show off. Last, it’s important to know that skin care can only do so much—if you have very deep-set wrinkles or pronounced sagging, a cosmetic dermatologist can offer procedures that will make a difference where skin care cannot. That’s why, for most people, the best approach to reducing wrinkles is a great skin care routine coupled with doctor-administered procedures to address deeper concerns.